Now that S2HD has entered phase 3 of production we have moved on to new targets for development. Goals for phase 3 include new zones, game modes, and characters. One of the the new jobs we have been most excited get onto, of course, is Super Sonic! We’re super excited to see Super Sonic with all his muscles in the game! Cool, I never thought of super sonic being ripped to the point of being torn in two. I think the new design for Sonic makes him look… chubby. Why not just use the Demo 2.0 sprites? I think perfectly capture his look and feel, and with Super Sonic, Loose the muscles, he looks better without them. =EXCELLENT JOB IS BEING DONE=!!!!! =BY THE WAY,WHEN FINISH THIS,HOW’S ABOUT SOME VERY SPECIAL THINGS LIKE SELF THEMED FAN SONIC GAME BETTER THAN MANIA OR SONIC 3 & KNUCKLES HD=?? Looks good guys. I’m not 100% sold on the 6 pack though 😛 hehe, looks kinda funny. boys got some guns too. He looks really good! There’s only one thing: please, don’t make him muscular. I like it but I think the muscles are a little too much. Totally wasn’t expecting that..
DEAR : Sonic 2 HD team. guys… the art work is top notch…. you should definitly consider working with SEGA to make a new sonic game… or sonic mania plus DLC… but i think this art work is perfect….. i cant wait till the full game is complete. bye for now. I can tell this is April Fools…because there actually is a little bit of OA available. 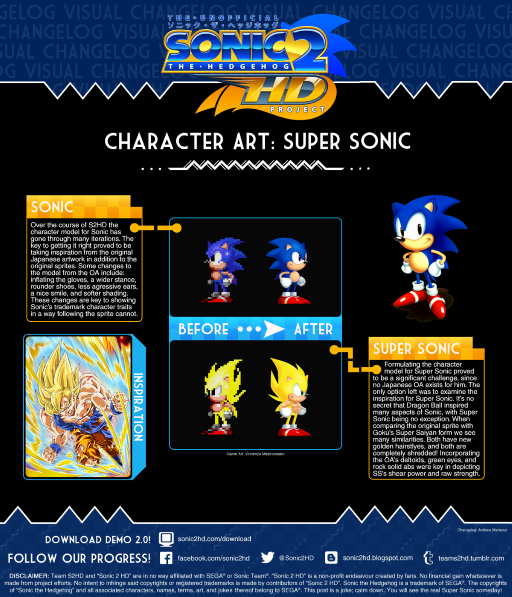 Perhaps ironically, the poses Super Sonic is drawn in (in the concept art) reinforces even further that Super Sonic is directly based on Super Saiyan Goku.